- Znamensky (until 1649 was called Rogdestvensky), begun to build in 1612, finished in 1615. - Sviato-Troickiy - the 1st half of the 17th century. - Aleksandro-Mariinskaya obshina is near Shigri (until 1905 was a women terminal home). The most famous temples in our region are Znamensky in Kursk and Korennaya Pustyn in the region. At those times when Kursk and its region were ruined by the Tatars� hordes it seemed that everything declined and would newer recover, the 8th of September of 1295, in 27 versts (old Russian measure of distance) of Kursk, in roots of a tree, on the river Tuskar bank there was the icon of Znameniya Bogomateri found. According the legend, when the icon was taken from the ground there a source of clean water appeared immediately. The news of the icon came to the Rylsk prince - Vasily Shemiaka (15th century) that ordered to bring it to Rylsk. Crowds of people were watching the arrival of the icon, but the prince refused to meet the icon at the very last moment. In answer to his action the icon blinded him. Having repented of his action, V. Shemiaka prayed for mercy and recovered� To thank the icon for his recovering, the prince built a temple for the holly icon. The temple was named Rogdestva Bogorodetcy. However, the icon disappeared, in a strange way, from the temple built in its honor and appeared in the place it had been found. Each time the icon was taken to Rylsk it returned to the place it had been found. 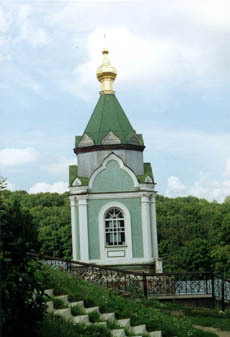 Therefore, in Korennaya Pustyn, there was a chapel built in which the icon was. In 1615, after the Polish defeat in Kursk, in honor of that event and to execute the promise there was a community of monks built. It included 2 wooden churches: Rogdestva Bogoroditci and holly Mikhaila Malena. B 1618, the icon got a name Znamenie (Prediction) and was taken to the new built temple � Znamensky. In 1631, a strike of lightning caused the devastating fire that destroyed the temple. In 1634, the renewed temple was completely robbed by the Polish. In 1649, the tsar Aleksey Mikhailovich ordered to build a stone church named Znameniya Kurskoy Bogomateri, and the temple got a new name � Znamensky. 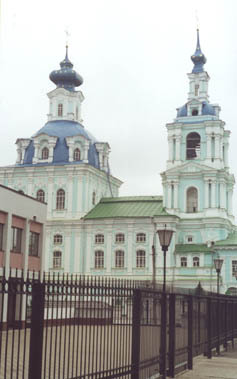 In 1815, the walls of the Znamenskaya Church were broken because of the foundation weakness, and a year later there was founded a new cathedral that was finished to build in 1826. In the 18th century, Korennaya Pustyn was rebuilt of stone. From 1618, it was occasionally, and from 1726 to 1765, it was systematically that the icon Znamenie was taken from Znamensky temple to Korennaya Pustyn for a week. 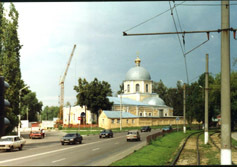 There were the continuous disagreements between Znamensky temple and Korennaya Pustyn, whose property the icon had to be. Korennaya community of monks was under the Znamensky temple ruling, but the solution was not found. In 1767, Synod banned bringing of icon any longer. In 1792, the Sacred procession was renewed in answer of merchants� requests. The Sacred procession promoted the fair development. In the order of Synod dated by the 15th of January of 1806, it was said that in agreement with the imperator Alexander the 1st the icon Znameniya Bogoroditsi had to be in Korennaya Rogdestvo-Bogoroditsi temple from the 9th week after the Easter to the 12th of September. This time Kursk eparchy makes sacred processions regularly. The best time for Kursk Korennaya fair was in 1852-1853, when there were goods sold on 11.3 mil. rubles. The biggest quantity of pilgrims � 60,000 was in 1861. There had been several copies of the holly icon made in different times. 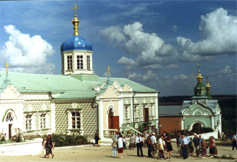 They were exhibited in Znamensky temple and in Korennaya Pustyn during the original had been absent. They took their part in the Crimean War in 1689 and the Patriotic War in 1812. In 1919, the icon appeared in Serbia, where it was until 1944, then it appeared in Munich, and in 50s it got to the USA. Now, it is in one of the temples of Russian Orthodox Foreign Church in New York. In 1989, Russian Ortodocs Foreign Church handed over a copy of the holly icon as a gift to Korennaya Pustyn. Estate Marino appeared in the beginning of the 19th century on the lands of the ancient village Ivanovskoe. Up to our days there have existed Mazepa�s apartments and not a large �kamenitsa� (now, it is a folk museum of Ivanovskoe) � worth and rear memorials of civil architecture that combine the features of Russian and Ukrainian baroque of the beginning of the 18th century. For 2 centuries of their existence those buildings have been in fare and rebuilt several times. In 1811, Ivan Ivanovich Baryatinsky got the estate in inheritance. He thought to rebuild the estate such a way it would not be worse of the best orthodox specimens of palace and park art in Petersburg, Moscow and their suburbs. Wealth, connections and high ranking by the Court let him carry out his project soon. A palace and park ensemble Marino was built in the 20s of the 19th century and took the significant place in a row of the great landlords� estates. The center of the composition is the third-floor palace that was built in 1820 by the project of Kursk architect Karl Ivanovich Gofman. 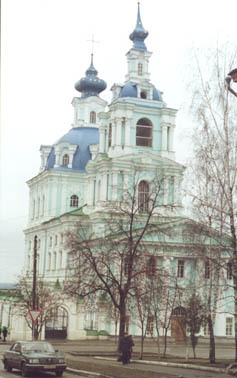 At first, the palace was called by the Izbitsky Dom. 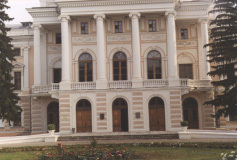 Such a name the palace got from the river Izbitsa, and then its name was changed into Mariin, as was the whole estate called in honor of the first and the second I. I. Baryatinsky�s wives. By the river Izbitsa, there was large Mariin Lake dug. On the oval island of the lake, there was a pseudo Gothic chapel built for the princess Maria Fedorovna. A special fleet was built, as well as copper cannons made. In the estate, there was one of the best theatres in the guberniya (the territory of Kursk region). The orchestra included 40-60 skilful musicians. The prince Ivan Ivanovich Barjtinsky dead the 13th of June of 1825 and was graved in a family vault of the Pakrovskaya church in Ivanovskoe. In 1869-1873, the palace was completely rebuilt by the famous Peterburg architect I. A. Monigetty (1819-1878) project. The architect who rebuilt the palace was Kursk architect K. F. Shtolch.  The project of reconstruction included the influence of new art tests. The palace was rebuilt in the neoclassical stile that was very popular in the 70s of the 19th century. Until 1917, the estate was the Baryatinskys� property, which meant keeping the family rarities. In 1918-1919, the palace was robbed by the local peasants, and what was saved was taken to Moscow. The greatest library of rear books was handed from the palace to the Historical museum in Moscow. Nowadays those books are in the Russian State Public Historical library in Moscow. In 1919-1922, in Marino, there was an agriculture school. From December of 1922, in the estate, there was the Central Executive Committee resort of the USSR. Now, Marino is one of the best places to rest in Russia.